This edition of the 'Oxford School Spelling Dictionary' has been revised to include new words and updated in line with modern spelling and the curriculum. Its new layout makes this book simple and accessible with the alphabet on each page, a colour thumb tab, and guide words at t... read full description below. 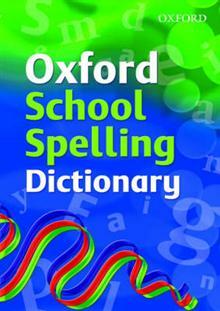 This is a new edition of the Oxford School Spelling Dictionary, revised to include new words and fully updated in line with modern spelling and the curriculum. . Its new layout makes this book simple and accessible with the alphabet on each page, a colour thumb tab, and guide words at the top of each page. Locating words has never been so quick and simple - here is the perfect book to make spelling easy and make you confident that you have got it right. The footnotes throughout help build spelling knowledge and lead you from an incorrect look-up to the right word easily. Panels give extra information on spelling rules to put the building blocks of learning in place. A great tool for supporting writers both at home and school. Carefully prepared for KS2 and the in line with the new Primary Strategy.